Basal cell carcinoma (BCC) is a type of skin cancer. It is the most common form of any cancer diagnosed in the U.S. and accounts for 80% of all skin cancers. BCC appears on areas of the body that have had the most sun exposure. This includes the face, ears, scalp, back of the neck, and back of the arms and hands. Basal cell carcinoma (BCC) is relatively easy to detect. If it is found early, treatment of basal cell carcinoma is simple and effective. 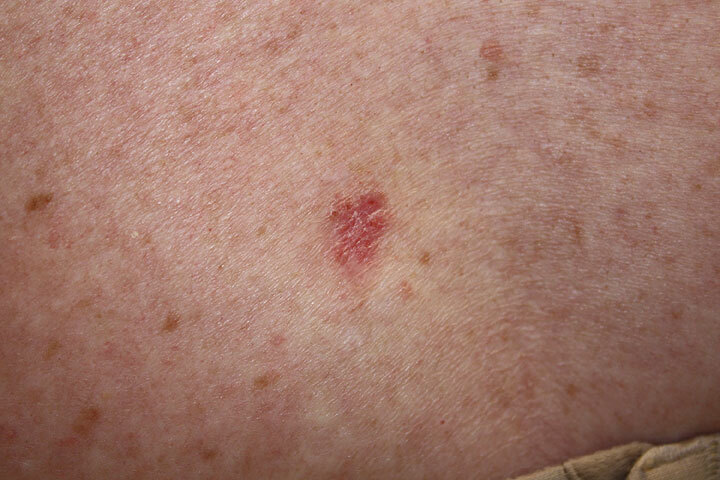 1) Superficial—This type of basal cell carcinoma is usually seen on the trunk or extremities. It appears as a reddish spot or patch with a fine scale on the top. It can appear like a small patch of psoriasis. It can occasionally appear with a small erosion on the surface. 2) Nodular—This is the most common type of basal cell carcinoma. It appears as a waxy or translucent nodule that may have fine blood vessels (capillaries) on its surface. The center may ulcerate, creating a sore that never completely heals. They may occasionally be pigmented like a mole (nevi). 3) Sclerosing or morpheaform—This type of basal cell carcinoma appears like a scar with poorly defined (blurry) borders. It is usually flat with a thinning of the skin. There are several treatment options available for basal cell carcinoma. Cure rates for most modes of therapy are excellent for basal cell carcinomas that has not metastasized to other parts of the body. Your doctor will recommend a treatment based on the type of basal cell cancer, its size, shape, and location. Your doctor will also take into accout your medical history, response to any previous treatments and personal preferences. 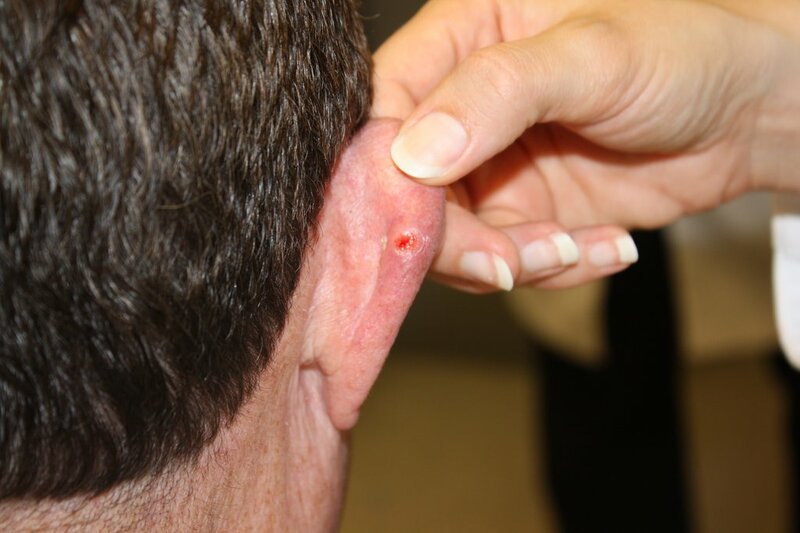 The photos below show the use of excision to treat basal cell carcinoma. Curettage and cautery. Curettage and cautery involves scraping away the cancer with a specialized device (curette), then destroying a thin layer of surrounding tissue with heat. Cryotherapy. Cryotherapy involves freezing off the cancerous lesion with liquid nitrogen. The freezing injury causes the skin to slough off. Excision. The cancer is cut away with a scalpel and the wound is closed with sutures. Mohs Surgery. Mohs Surgery is a precise method for removing cancerous tissue, while sparing the greatest amount of healthy tissue. Mohs Surgery is usually recommended for skin cancer removal in anatomic areas where maximum preservation of healthy tissue is desirable for cosmetic and functional reasons, such as the face, neck or hands. Photodynamic therapy. Photodynamic therapy (PDT) is a cancer treatment that uses a drug and a certain type of laser light to kill cancer cells. A drug that is not active until it is exposed to light is injected into a vein. The drug collects more in cancer cells than in normal cells. For skin cancer, laser light is shined onto the skin and the drug becomes active and kills the cancer cells. Photodynamic therapy causes little damage to healthy tissue. Treatment of recurrent basal cell carcinoma is usually Mohs micrographic surgery. Erivedge® (vismodegib). Erivedge® is a prescription medicine used to treat adults with a type of skin cancer, called basal cell carcinoma (BCC), that has spread to other parts of the body or that has come back after surgery or that your healthcare provider decides cannot be treated with surgery or radiation. Imiquimod cream (Zyclara®). Topical imiquimod therapy (a cream applied to the skin) may be used to treat some small basal cell carcinomas. Treatment of basal cell carcinoma that is metastatic or cannot be treated with local therapy is usually chemotherapy or a clinical trial of a new treatment.